Professionals use Docket Alarm to conduct background checks on potential clients, partners, investments, and more. Docket Alarm can identify red flags, like past or pending federal litigation, involvement in bankruptcy proceedings, and even disputes over IP assets. While you can search for a company’s background information on Docket Alarm’s robust search platform, the real utility is in Docket Alarm’s ability to automate these types of checks. Using Docket Alarm’s API (Application Programming Interface), you can set up recurring background checks on particular entities or individuals. 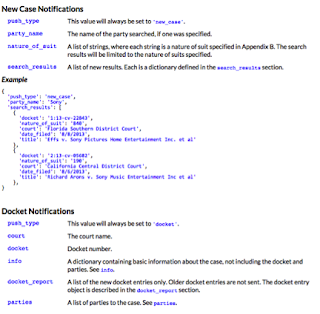 Docket Alarm will send you API push notifications and an email for a chosen party when a docket is created or updated. Dockets are created or updated when a party is sued or sues another, files for bankruptcy, is prosecuted for a crime, or appeals a judgment. For example, if your venture capital firm is looking to invest in a particular company, you can use Docket Alarm’s API to send you push notifications and emails when the company has been sued, files a lawsuit against someone else, or files for bankruptcy. You can also set up similar alerts on your competitors. This type of automated due diligence allows you to quickly evaluate risk and identify problems or opportunities as they arise, not weeks later. Additionally, these types of company-specific notifications can also be used to continuously evaluate the risk in ongoing relationships. What sets Docket Alarm apart from other services, is that Docket Alarm is integrated directly into the U.S. court and bankruptcy system. While other services can have information that may be months or even years out-of-date, Docket Alarm alerts are in real-time. Docket Alarm’s open API can be seamlessly integrated with existing conflicts and background check software. Visit www.docketalarm.comtoday to sign up for automated background checks with Docket Alarm’s API.